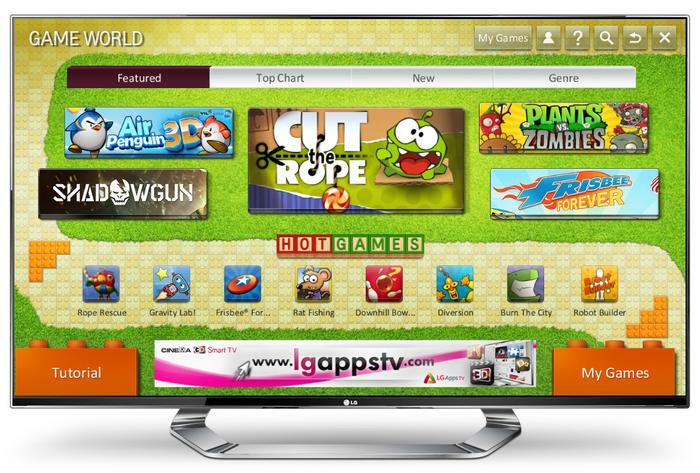 LG has introduced a Game World portal for its Smart TV service, bringing over 80 games to its 2012 range of Cinema 3D TVs. This move singles LG out as the only Smart TV provider with a significant library of tailor-made games available directly through televisions, with games that are aimed at casual and younger users. The archetypal Plants vs. Zombies leads LG’s Game World line-up, with other recognisable titles like Bookworm and Mahjong joining lesser-known dark horses like Push ‘em Penguin, Burn This City and Amazing Adventures Around The World. Around three quarters of the titles available at launch are free; the other 22 range from 99 cents to $5.82. 10 are compatible with the TVs’ Cinema 3D passive stereoscopic effect and cheap 3D glasses. Game World will divide content under a variety of categories, with Featured, Top Chart and New titles being split from the catch-all Genre heading. The games are described as family-friendly, and the majority will be able to be controlled with LG’s motion-sensitive Magic Remote. Third-party controllers, like Microsoft’s wired Xbox 360 gamepad and a variety of Logitech models, are supported through the TVs’ USB ports. LG’s LED-backlit Cinema 3D LCD TVs are first to receive the Game World portal, with plasma TV owners having to wait — not long, since Game World should be “available soon” on those models. The service will automatically prompt LG TV owners to download it, as long as their televisions are connected to the Internet. LG’s senior marketing manager for content and services, Brad Reed, is expectedly optimistic about Game World: “Game World will host some of the most popular gaming titles on LG CINEMA 3D Smart TVs.